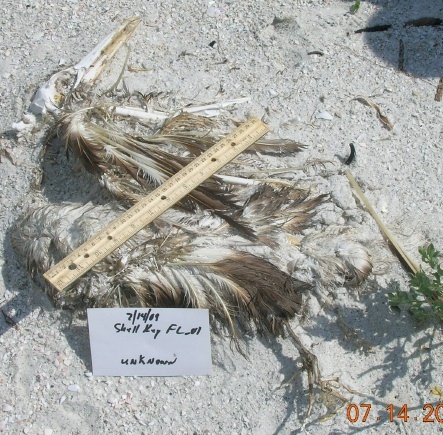 Looks like Seanetters generally were as stumped by this dead bird as our Florida contingent was. It’s always particularly difficult to i.d. skeletal remains since just about all the usual field marks have been obliterated. The skin of the unfeathered regions weathers away, and the keratin sheath that gives the bill its characteristic appearance is gone. In cases like this, it’s easy to feel adrift. Our unfortunate Shell Key specimen is, in fact, a Northern Gannet. Now, we must get to work figuring out how one might tell. 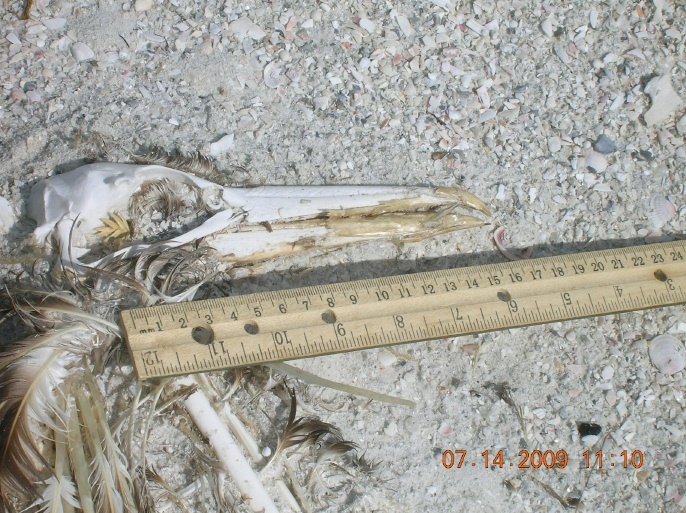 Take a look at this photo of a Common Loon’s bill (courtesy of an excellent website on seabird bones: http://www.shearwater.nl/seabird-osteology/). No one guessed loon, incidentally, but SEANET does not have any photos of heron skulls on hand, alas. The fundamental difference one should note between the loon and our Gannet friend is the lack of nostrils in the bill of the Gannet. The Gannets and other pouchbills, like cormorants and pelicans, lost their external nostrils over evolutionary time and only a small opening in the bone at the base of the bill remains. Once you’ve determined that the bird is a pouchbill based on lack of nostrils, it’s a matter of comparing the bill profile. Pelicans are so bizarrely distinctive that we can exclude them out of hand, but cormorants are still a possibility. Upon closer examination, however, one notes that cormorants have a more slender bill with a much more prominent hook at the bill tip–nearly a 90 degree angle. So we can be pretty confident that this guy is, in fact, a Northern Gannet, and based on the dark plumage, it’s a juvenile. Oh, wait, what’s that you say? The feet weren’t webbed? True, by the time the specimen was found, no webs were present. But consider the state of the carcass. No soft tissue is left whatsoever, and what are foot webs but thin, fleshy triangles? They would long since have rotted away leaving only the skeletal toes lending it the appearance of a heronish sort of bird. It’s largely unexplored country, this land of seabird forensics, and this has been a particularly good case. Thanks for playing Seanetters! These photos came to SEANET from Gabe Vargo, our excellent local coordinator wrangling the volunteers down in the Sunshine State. The carcass was in quite bad shape–mostly skeletal. Gabe submitted the photo for consideration by some experienced birder types and it generated quite a spirited discussion as to the bird’s identity. The photos came with a note reading “the feet were not webbed.” So now we open up the debate to all you Seanetters. Think you recognize this guy? Post your guess (or confident assertion) on the blog and SEANET will get you the answer later this week with some helpful hints for identifying very decomposed birds. You’re a special breed Seanetters–keep up the good work. French scientists have come out with a study offering a potential explanation for the spectacular winter die-offs seen in alcid species all over the world. Known as “wrecks,” these die-offs involve hundreds or even thousands of alcids (like Dovekies, puffins, and murres). Volunteers in our sister program, COASST, surveying beaches in the Pacific Northwest and Alaska see these wrecks among Common Murres almost every winter. Here on the east coast, Dovekie seem to be the most common victims turning up on our shores. One report from New York City in the 1930s reported Dovekies literally raining down in the streets after a storm. So certainly these phenomena are not new, but up to now, explanations for these events had been mainly speculative. The new study out of Europe appears in the Journal of Experimental Biology and focuses on two species: Little Auks and Brunnich’s Guillemots. One of the reasons these die-offs have been so hard to study is the inaccessibility of seabirds during the winter months. Unlike during the breeding season when the birds congregate at nesting islands, in winter the birds are widely scattered and foraging in the open ocean. To combat this substantial challenge, the scientists utilized a computational model to estimate the metabolic demands placed on the birds by cold temperatures, severe storms, and unpredictable prey distributions. The results were startling: the 150g Little Auk would need to consume a stunning 289g of zooplankton each day to survive, and the 1000g Brunnich’s Guillemot would need to wolf down over half its body weight in small fish and crustaceans. The scientists suggest that many of the birds are simply unable to find that massive amount of prey each day and succumb to cold temperatures and harsh weather. 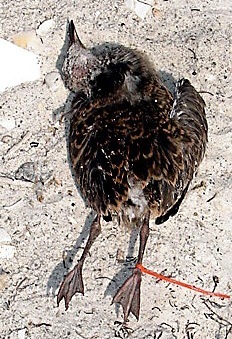 This hypothesis is certainly consistent with necropsy findings from alcids found dead on the beach; most are emaciated but show no other signs of illness or injury, suggesting that the birds simply starved to death. Though winter wrecks are not new, this study begs the question: what will happen to alcid species as their prey base declines? Overfishing and climate change conspire to reduce the food available to all seabird species, and for these alcids, already on a knife’s edge of survival in the unforgiving Atlantic in winter, this could prove catastrophic. All the more reason for Seanetters to be out there watching the shores so we can detect shifts in mortality among these diminutive seafarers. So keep that in mind when these warm summer days fade and with it your resolve to survey. The alcids need you Seanetters! Having put off the big reveal of the answers to last week’s dead bird quiz, I was relieved that quiz maven Jenette indeed submitted her guesses. And Jenette will be forgiven for struggling with these two. The first, a Royal Tern, is truly a denizen of the south. While they do breed along the mid-Atlantic coast and (just barely) up into southern New England, eBird stats show only a handful of sightings here in Massachusetts, and those are strictly limited to the summer months. The Royal Tern is quite large, though the similar looking Caspian Tern is larger still. The slender orange bill of the Royal Tern is the main identifier here. In terms of life history, the Royal makes its living in the typical tern way: diving from some height after small fish and shrimp. Nest sites are small scrapes in the sand on breeding islands rimmed (charmingly) with hardened feces. 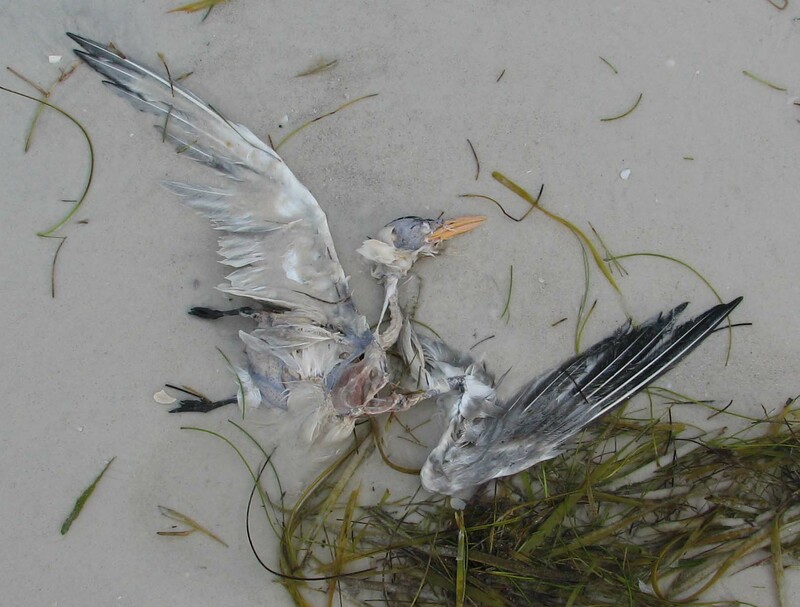 This dead bird quiz has reinforced SEANET’s belief that we need a Beached Bird Guide to the southern states in addition to our existing guide to North Atlantic dead birds. We’re working on it! (Slowly). As for Bird B, the difficulty in identifying this one is twofold–not only is it more of a southern species (though Laughing Gulls do breed along the New England coast), but gulls, like most seabirds, breed almost exclusively on islands. So even very observant birders who are familiar with the young of passerines, or raptors or the like, may never see the young of a seabird. While our more common Herring Gulls and Great Black-Backed Gulls are also rather dark as youngsters, this Laughing Gull is a much more extreme example, with an entirely brown and black dorsum. This guy is very young indeed–not even fledged yet, so the average Seanetter would not encounter such a bird unless she were walking a breeding island or the carcass managed to float across to the mainland. And as a final confession, I enlisted our expert panel for both these i.d.s. As a life-long New Englander, I was pretty well stumped too! Since she asked so nicely, I have granted the request of loyal blog reader Jenette and will postpone revealing the dead bird quiz answers until Monday. But this means you definitely have to take a guess Jenette! 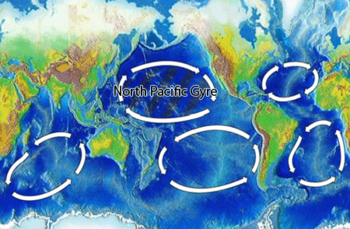 The five oceanic gyres--does this mean there are five Marine Garbage Patches? In other news, we received a comment on an earlier post regarding the Great Pacific Garbage Patch. Commenting on the map included with that post (shown again here), Chris wrote, “We have multiple Gyres on this map, does that mean that each of them has a garbage patch?” It is an excellent question, and one to which, remarkably, we have no answer. The Great Pacific Garbage Patch is located in the North Pacific Gyre and was discovered only recently. Oceanographers suspected as early as 1988 that such a place likely existed in the North Pacific, but it was not until 1997 when sea captain Charles Moore, returning home from a sailing race, decided to travel through the remote and almost never visited region of the Pacific known as the doldrums. He and his crew were the first to report the giant marine dump after that trip. While the description of a ocean based garbage patch conjures images of floating tires and detergent bottles which must be visible on satellite photographs, most of the debris is actually quite small and consists of plastic fragments suspended in the water column to a considerable depth. As a result, even this massive accumulation of trash is not visible on your typical google earth image. So, after that long-winded response, the short answer is that no one has yet ventured through the centers of the other oceanic gyres to survey them for debris. And since shipping lanes avoid these becalmed and far distant waters, there just isn’t anyone headed out that way on other business. Oceanographers presume that similar garbage patches exist in all the gyres, though they believe the North Pacific Gyre likely contains the largest amount of trash. Bird A: Found by Ruthellen Piepert of Florida in May. Bird A comes to us from volunteer Ruthellen down in Florida. She reports that the bird had a wing chord of 38cm, culmen of 55mm and a tarsus of 38mm. I’m sure our southern friends won’t have any trouble with this one, but you northerners give it a try too! Bird B: Found by Melissa Buhler of Florida on June 20. Bird B, found by Melissa Buhler in June, is a youngster–nearly a fledgling– and might present more of a challenge to you. But I have no doubt that you Seanetters will come through! Answers to be revealed tomorrow! In an unfortunate irony, hundreds of Ring-Billed Gulls were killed when a substance appearing to be cooking oil flowed out of a sewer pipe into the Cuyahoga River in Ohio. Environmentalists had just celebrated the river’s remarkable comeback 40 years after it became an icon of industrial pollution and a major inspiration for the passage of the Clean Water Act. Sewer workers noticed a sheen on the water earlier in the week and placed containment booms to limit the oil’s spread. 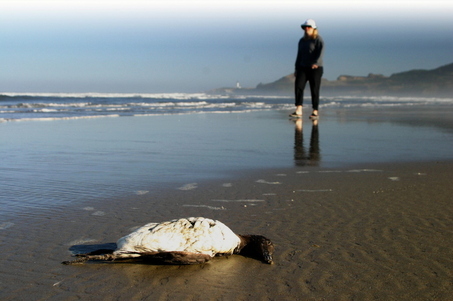 Soon after, they had to contact the EPA and report that the oil had escaped the booms and was spreading downriver, matting the feathers of a large flock of resident gulls on the river and killing them. 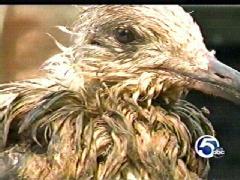 An estimated 500 gulls were found dead due to the spill and an additional 30-40 gulls were humanely euthanized. It appears that no other species were affected, and the Ring-Billed population in Cleveland has reached nuisance levels, so wildlife management officials elected not to attempt to rehabilitate the affected birds. Officials have yet to identify the source of the oil, or determine who dumped it. The Cuyahoga River runs through an industrial area, but clean up efforts over the past decades had made it one of the success stories of the Clean Water Act. This spill illustrates the need for constant vigilance and continued dedication to maintaining clean waterways. SEANET will continue to follow this story and inform our readers if and when the source of the oil can be determined.